It’s the start of a new year, which means we are busy planning our upcoming summer travel. In July of 2018 we’re heading to Ireland for a good friend’s wedding. Given our love of long-distance hiking, we quickly got to work on finding a trek we could add on to our trip. After exploring some options in Ireland we ultimately decided to tackle the West Highland Way through the Scottish Highlands. We’ll spend 8 days hiking this 96-mile trail before hopping over to Ireland for the wedding. We’ll have many more posts on our West Highland Way trip in the future – but for now let’s focus on how we’re getting across the Atlantic and back for less than $100 per person! As is the case with all of our international trips, the flight makes up a huge portion of our budget. Flights to the UK and Ireland from the US can run well over $1,000 in the peak summer season which can quickly bust your travel budget. 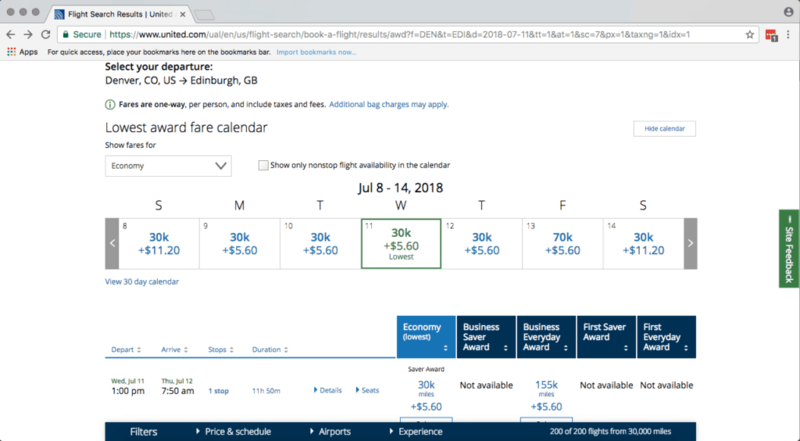 Using the travel hacking strategies described here, we were able to fly from Denver, Colorado to Edinburgh, Scotland and home from Dublin, Ireland for less than $100 per person. We booked our flights using the Singapore Airlines KrisFlyer miles and British Airways Avios miles that we had accrued from opening just two credit cards – the Citi Prestige card and the Chase British Airways card. The points awarded from the Citi Prestige card can be transferred to a number of airlines, including Singapore Airlines KrisFlyer miles. The Chase British Airways card awards Avios, which are British Airways miles. The great thing about using KrisFlyer miles and Avios is that they are transferable from all of the major travel credit cards (Amex Membership Rewards, Chase Ultimate Rewards and Citi ThankYou points) to these airlines. Our search results on United.com for a Denver to Edinburgh award flight. The 30,000 mile Saver Award is what we’re after! 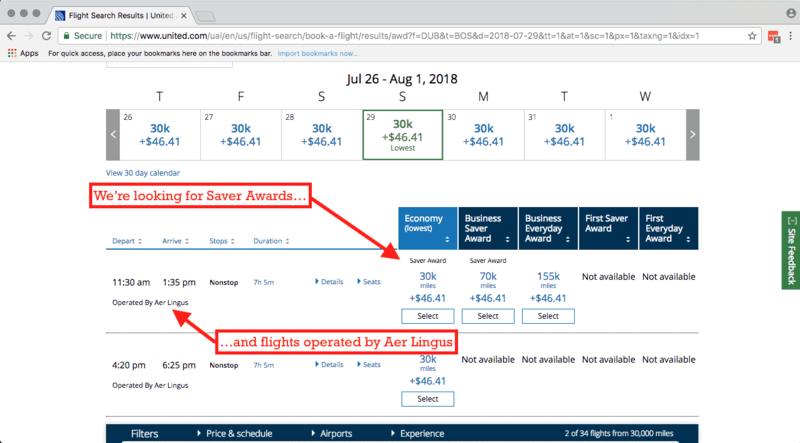 Once you find a date that has saver award space (this will show up as requiring 30,000 United miles) you can call Singapore Airlines to book. This can be a slightly exhausting process as Singapore doesn’t always have the best customer service, however it is well worth the effort for a nearly free flight. The flight above ended up costing us 27,500 Singapore KrisFlyer miles and $5.60 per person! After hiking the West Highland Way in Scotland, we’ll make our way over to Dublin, Ireland. For our flights from Dublin back to the States, we’ll use British Airways Avios miles to fly to Boston, and then we’ll use our Southwest Companion Pass for the final leg from Boston to Denver. British Airways Avios are one of our favorite miles currencies as they are easily accumulated via two of the main flexible points currencies (Chase Ultimate Rewards and AMEX Membership Rewards) as well as the Chase British Airways card. Another great feature of Avios is that their award flight pricing is based on the distance flown rather than set by region. For example, the United flight we booked above using Singapore KrisFlyer miles costs 27,500 miles no matter where we fly from in the Continental US. However, with Avios the number of miles needed depends on the distance of the flight. Since Dublin and Boston are relatively close for a cross-Atlantic flight, we’ll be able to fly one-way between the two cities for only 20,000 Avios, an incredible deal! Since Aer Lingus flights do not show up on the British Airways award search tool, we had to once again start our search for award availability on United’s website. You’ll want to select ‘Search for Award Travel’ as well as selecting ‘Non stop’ since we’re only interested in direct flights from Dublin to Boston. Looking at the results below for July 29th, you’ll see a couple of important items: 1. There is Saver level award space available 2. The two flights shown are operated by Aer Lingus. These are both important points because you’ll only be able to book seats at the Saver level using your Avios points, and you also want to be sure that the availability shown on United’s website is for flights operated by Aer Lingus. Once you’ve found the award availability to suit your travel schedule you’ll need to call British Airways’ customer service to book the flights. Be ready to feed the agent the date/time you’d like to fly and the flight number to help ensure the process goes smoothly. The total cost of our ticket from Dublin to Boston was 20,000 Avios and ~$85 per person in unavoidable taxes and fees. If you follow the steps laid out above you should be able to fly round-trip to Scotland and Ireland for less than $100!